During August–September 2001 a salvage excavation was conducted in the wake of damage to Kh. el-Qabra, located on a hill rising up on the southern fringes of the Bet Ha-Kerem Valley, north of the Giv‘at Ram neighborhood in Karmi’el (Permit No. A-3475*; map ref. NIG 22625/75815; OIG 17625/25815). The excavation, on behalf of the Antiquities Authority, was directed by E.J. 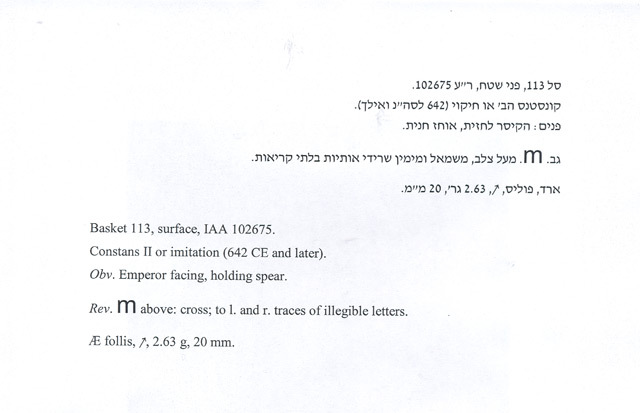 Stern, with the assistance of Y. Dangor (administration), H. Smithline (photography), V. Essman (surveying), V. Pirsky (drafting), H. Tahan (pottery drawing), D. Syon (numismatics) and Y. Gorin-Rosen (glass). Numerous building remains, as well as rock-cut tombs, agricultural installations and many water cisterns, attesting to the extensive occupation of the site, were visible on the hill and along its edges. One square (4 × 7 m, depth c. 1 m; Fig. 1) was excavated along the western fringes of the ruin, revealing three main strata. Stratum III was a terra rosa soil layer, which contained a few fragments of pottery vessels from the Byzantine and Roman periods, and was excavated down to bedrock (Loci 13, 15, 22). Stratum II consisted of a broad fieldstone-built wall (W17; width 3–6 m), oriented north–south and parallel to the contour lines of the hill. It seems only the core was preserved in the northern part of the wall. Wall 17 may have served as the foundation of a large building whose upper courses were robbed, or as a terrace wall that retained the land along the foot of the hill. The layer of soil that accumulated after the wall was no longer in use contained pottery vessels, dating mostly to the end of the Byzantine period (sixth century CE; Fig. 2:1–5) and the beginning of the Early Islamic period (the Umayyad and Abbasid periods; seventh–eighth centuries CE; Fig. 2:6, 7), as well as a few glass vessel fragments dating to the end of the Byzantine period and the Umayyad period and four small nodules of industrial glass waste that point to the existence of a glass production center on the site. It was impossible to determine, however, if this was an industry where raw glass was produced or a workshop for the manufacture of vessels. Large tesserae which indicated industrial installations and small tesserae attesting to a mosaic floor of a public building were also found. A coin (IAA No. 102675) was discovered on surface outside the excavation area. It is dated to the second half of the seventh century CE, which was apparently the date of this layer. 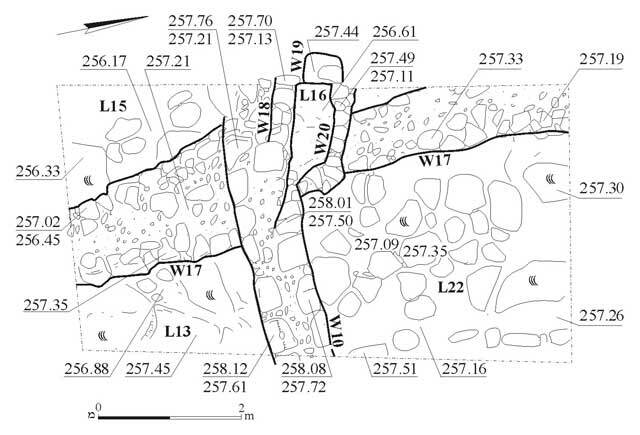 Stratum I had an east–west oriented wall, perpendicular to the slope of the hill (W10). It was built of dressed stones, probably in secondary use, and was perhaps used for delineating tracts of land. Wall 10 was found entirely sealed within a layer of gray soil, which mostly contained pottery vessels from the Crusader and Mamluk periods (thirteenth–fourteenth centuries CE; Fig. 2:8–17), including fragments of three imported vessels from Cyprus and from Port St. Symeon ware, dating to the Crusader period (not illustrated). 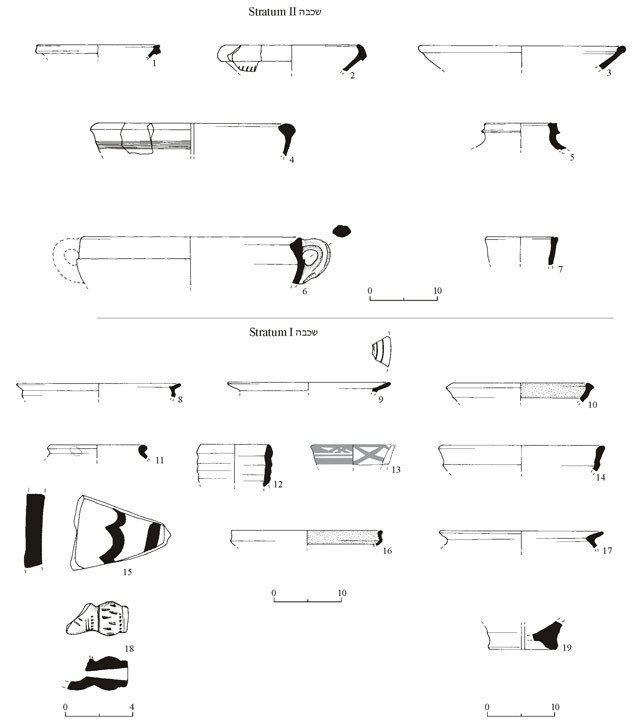 Pottery vessels from the early Ottoman period (fifteenth–seventeenth centuries CE; Fig. 2:18, 19) were also recovered from the soil layer, as well as fragments of glass vessels and a Crusader coin (IAA No. 102676; Fig. 4). The coin was struck in the city of ‘Akko at the end of the twelfth century CE. It therefore appears that W10 should be dated to the beginning of the Ottoman period. In the period of time following the construction of W10 a rectangular area (L16; 0.5 × 1.0 m), enclosed by three meager walls that were built of medium-sized fieldstones, without any bonding material (W18, W19, W20), was excavated. The purpose of the structure is unclear. Its shape and direction could indicate it was built as a tomb, although it contained no finds to verify this suggestion, except for a few potsherds and modern objects. This excavation––the first at Kh. el-Qabra––revealed a settlement that existed in the Roman, Byzantine, Early Islamic, Crusader, Mamluk and Early Ottoman periods. The tesserae indicated a public building (a church?) there, as well as an industrial installation (a winepress?). 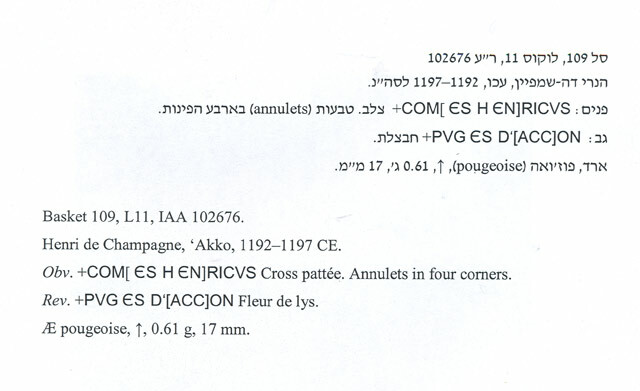 The coin and the three imported potsherds from the Crusader period clearly demonstrated that the site was occupied at this time and that its inhabitants had ties with the city of ‘Akko, but it could not be established if the residents were local or Franks. (ESI 3), Horbat Kenes (ESI 15) and Horbat Qav (HA-ESI 112) settlement remains, including churches and monasteries dating to the end of the Byzantine period and the Umayyad period, were discovered, as well as another settlement phase in the Abbasid period, after the buildings no longer served the Christian population. At Horbat Qav, remains of a massive building that dated to the Crusader period were exposed, as well as evidence of settlement in the Mamluk and Early Ottoman periods. All this data shows that an extensive Christian settlement existed in the Bet Ha-Kerem Valley at the end of the Byzantine period, extending into the Umayyad period. The settlement was renewed during the Crusader period in the region and was closely connected to the city of ‘Akko. The finds from the excavations add Kh. el-Qabra to this list of sites. 1. Plan of Strata II and I. 2. Pottery from Strata II and I.